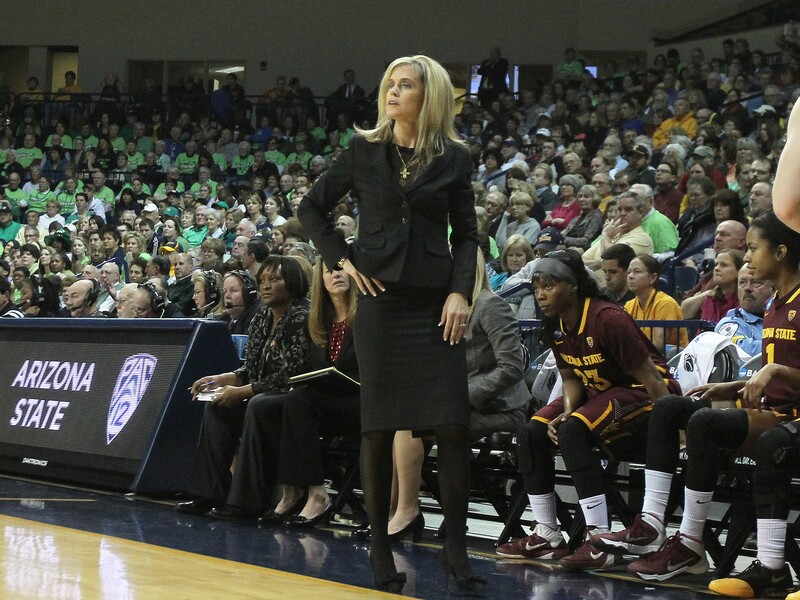 TEMPE – Arizona State women’s basketball coach Charli Turner Thorne said she sees plenty of advantages to recruiting locally, starting with players having a support system nearby. But for Turner Thorne and other NCAA Division 1 women’s basketball coaches in Arizona, hometown players aren’t in great supply, meaning recruiting trips to California, Texas and elsewhere. While NCAA rules allow 15 scholarships per season, Turner Thorne’s team has three players from Arizona, while the University of Arizona has two and Grand Canyon University has one. Northern Arizona University has the most, with five. Turner Thorne has commitments from two of Arizona’s 2015 recruits in guards Sabrina Haines of Phoenix’s Desert Vista High School and Armani Hawkins of Mesa’s Mountain View High School. Both are highly rated and received offers from other top programs in the country, but so far they are the only 2015 recruits from Arizona to commit in-state. Turner Thorne, who started coaching college basketball at NAU in 1994, has kept an eye on the state’s high school basketball products for more than 20 years. The quality has improved greatly over the past 15 years, she said, adding that she still struggles to find players outside of the Phoenix area. According to prospectsnation.com, a website dedicated to women’s high school basketball recruits, Arizona has seven in the class of 2015 with offers from Division 1 schools. Texas has 30 graduating in 2015 with Division 1 offers and California has 35. Trent May, head coach at GCU for six seasons, said he he rarely considers a player’s city and state when recruiting. Another challenge: Success on the court contributes to recruiting success, and ASU is the only program that consistently makes the NCAA tournament. Arizona hasn’t been made the tournament since 2005, NAU played its only NCAA tournament game in 2006 and GCU is in its second year of Division I athletics with a four-year probation and postseason embargo. Arizona head coach Niya Butts said she has more options for talent in states with a bigger basketball population, so that’s where she spends most of her energy recruiting. More than half of her roster hails from California and Texas. NAU has five players on its team who are all from the Phoenix area. Head coach Sue Darling regularly recruits high school and community college prospects in Arizona and said she is grateful to get the players. Darling also said that it could always be worse. 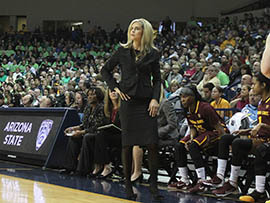 Arizona State women’s basketball coach Charli Turner Thorne said she sees plenty of advantages to recruiting locally, starting with players having a support system nearby.